NETWORK UPDATE: after the night’s NFL overruns were accounted for, UNDERCOVER BOSS gained 0.2 to 1.8, and the sliver of CSI that was in primetime was at 1.4. SUNDAY NIGHT FOOTBALL, meanwhile, adjusted up to 6.6, up half a point from the previous week’s game. 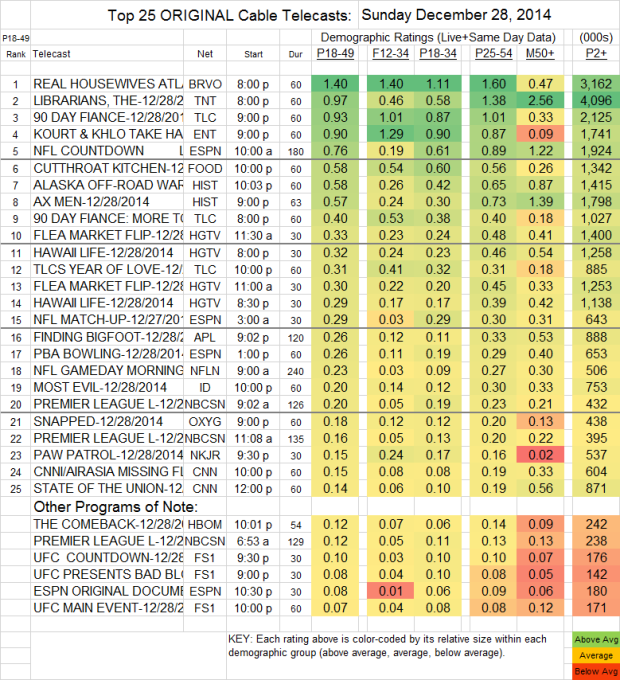 REAL HOUSEWIVES OF ATLANTA remained atop the Sunday cable ratings, up 0.14 from last week to 1.40. It was a good week for TNT’s THE LIBRARIANS, up an impressive 0.21 to 0.97. TLC’s 90 DAY FIANCE and E!’s KOURTNEY & KHLOE TAKE THE HAMPTONS were also way up, respectively by 0.27 to 0.93 and by 0.28 to 0.90. FIANCE had a pre-show at 0.40, and a 10PM YEAR OF LOVE special was at 0.31. On History, ALASKA OFF-ROAD WARRIORS was up 0.15 to 0.58, and AX MEN was up a tenth to 0.57. The (season? series?) finale of THE COMEBACK (HBO) doubled the previous week at 0.12.